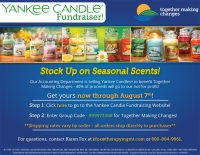 Together Making Changes Yankee Candle Fundraiser! Candles can be purchased between May 29, 2018 – August 7, 2018. For questions, contact Karen Fox at kfox@therapymgmt.com or 800-804-9961.